The ability to look at life with composure is the first step towards becoming a yogi. This capability called Samatva enables one to treat both happiness and sorrow with equanimity. 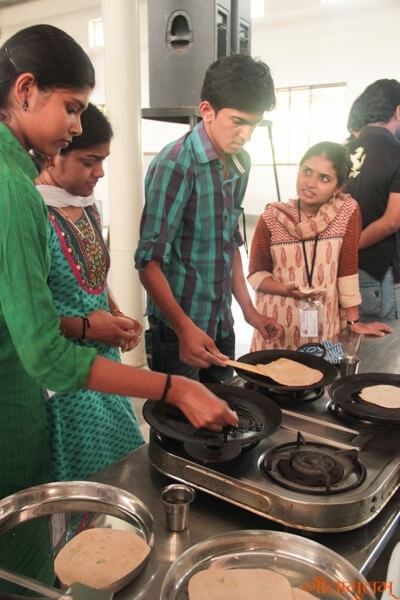 As part of Nipun ’18 camp, a session on this skill was conducted by eminent scholar V. Shankar Kumaran. 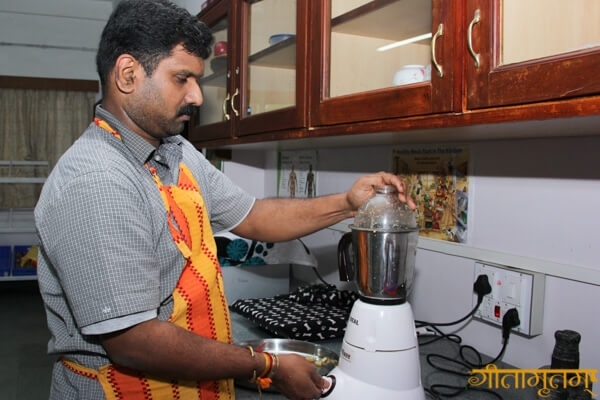 Prof. Sankar is a passionate research scholar who cherishes his Gurukulam education experience which has empowered him to apply the vast knowledge of Upanishads into day-to-day life situations. 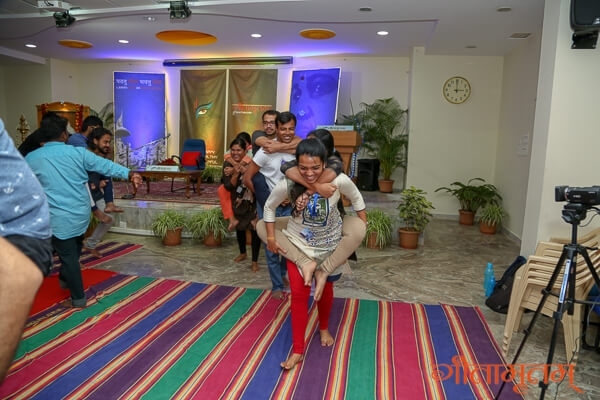 The participants found the interaction to be a joyous, fun-filled experience and they found the storytelling skills of Prof. Sankar to be amazing and spontaneous. For many participants like Arpit Agarwal, sessions like this are a boon to those who are looking to apply the theoretical knowledge of ancient scriptures in real life. 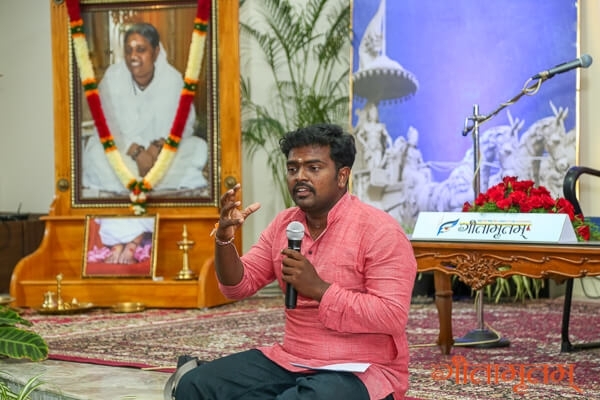 Shakthi Subramanian also felt the same way and remarked that if somebody wanted to implement the Gita principles in their life, the session was helpful in connecting the dots from theory to practice. To be level-headed in life is very important, observed Gayathri Sarmishta, who said that you should learn to treat every situation with self-control. 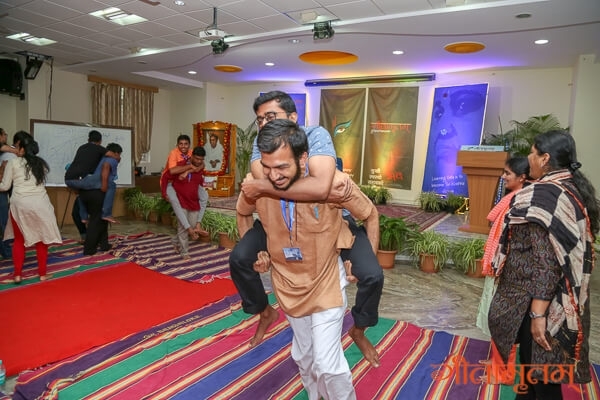 ‘’Shankar-ji taught us how to take negativity in positivity and both positivity in negativity.’’, said Arun Kumar S. The session helped him to realize how fragile is human joy and seek real happiness which is an everlasting experience. The concept of being alive at the moment came as a revolutionary revelation and the participants realized that it is where true happiness lies. 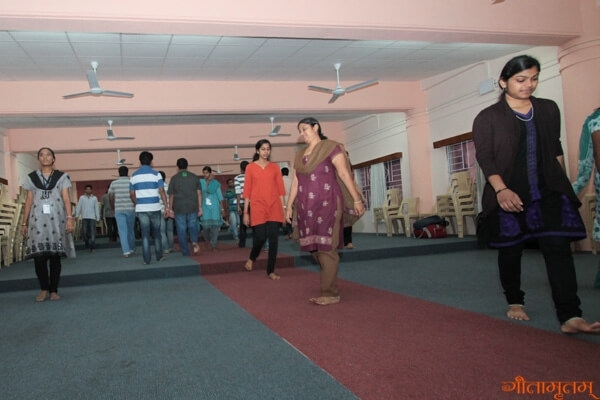 The way Prof. Sankar conducted the session through activities won the hearts and minds of the participants and many found the experience to be helpful in doing an introspection. It was a refreshing experience for the audience which employed a beautiful & systematic approach towards spirituality through activities, observed Subhilash PS. Getting a deep insight about the way our brain works around success and failure was a great revelation for many, as realized by Abhishek Ahuja. By inventing stories about success and failure to tell ourselves, we’re facing away from reality and fooling ourselves, he remarked. The session has taught him to be honest and find true happiness in mindful actions. 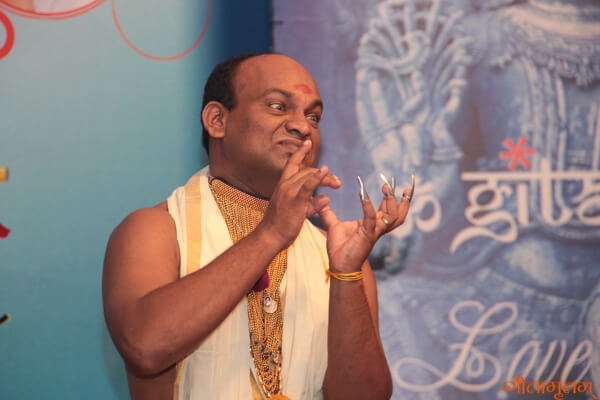 Shankar Ji’s expressive way of presentation became an instant hit with youngsters, said Aswin Kumar and expressed his keenness to attend more of his workshops. Many participants had issues like overcoming fear and standing up to challenges but the session made them realize their true potential and rise like true warriors. 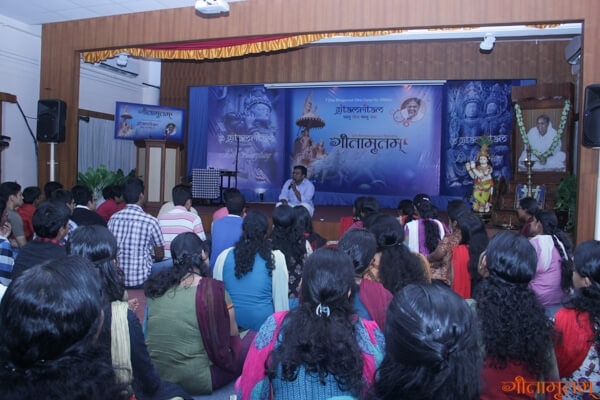 ‘’The message that Arjuna ultimately gained from Gita was ‘get up and fight’ and this was the message I got from Samatva workshop too.’’, said Praveen Raja. The session was truly enlightening and I realized that it is the uncertainty which makes life beautiful, he observed. 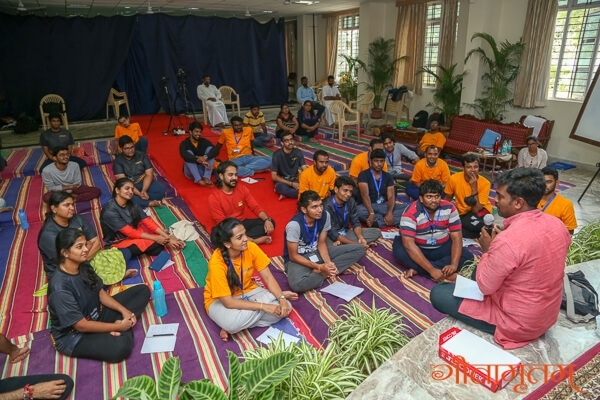 When the session was over, all of the participants were excited about the soul-stirring experience they had and everyone was keen to attend more workshops of Shankar Kumaran. 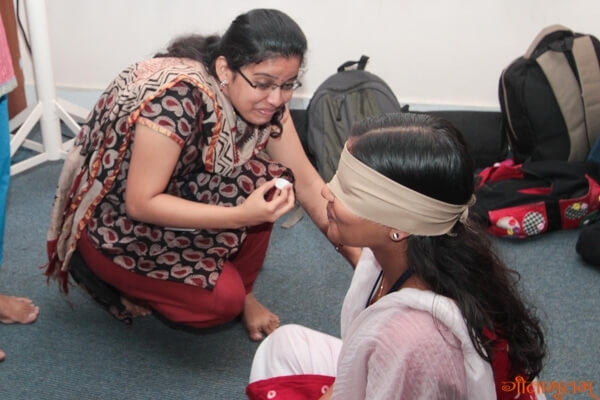 Traditional Indian family roles were reversed during this workshop. 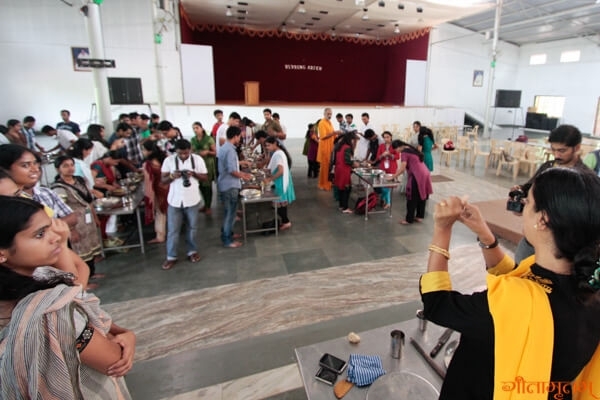 Male participants were entrusted with the task of cooking a wholesome meal for the whole group, while the female participants were asked to do the electrical and automobile works. 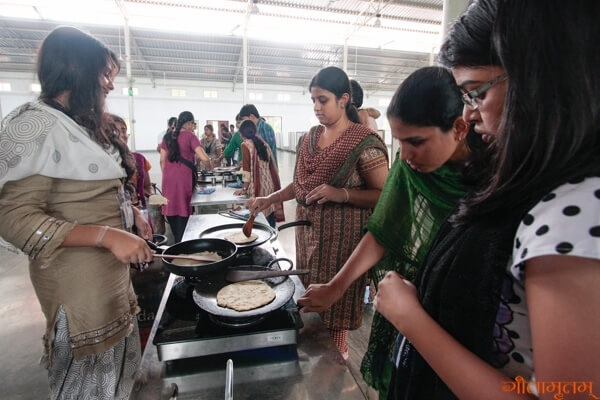 Interestingly few of the male participants have never ever entered the kitchen other than for eating. 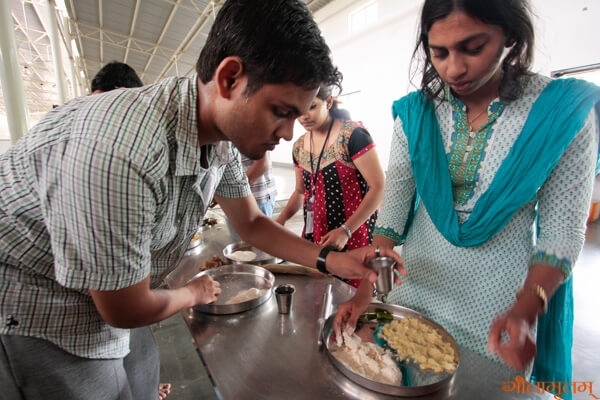 enjoyed to the core – cooked and got to know what and how our mother, wife do cooking. Nice experience! Preparing food for around 25 was a challenge. Anyway, we survived..
Fun and exciting. Learnt to peel onion :). The block that held me back from cooking got removed. This was the best thing in the whole workshop. It made the husbands realize that they can also contribute in kitchen works. It made the wives realize that their better halves will contribute in kitchen cores if they support them. We enjoyed seeing our husbands cooking and it came out so well. There was a lot of love and affection we could see in the cooking and also the food tasted good. It helped me to realise that anyone can change according to the circumstances. Super Food it was. hats off to the husbands. 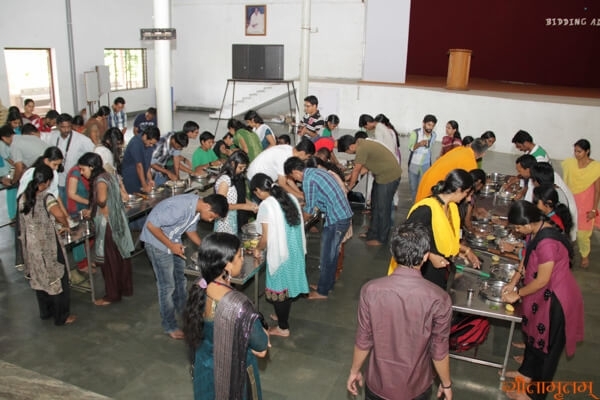 Male participants were entrusted with the task of cooking a wholesome meal for the whole group, while the female participants were asked to change the tyres of a car, change tube lights, repair a fan, and assemble computers. All the participants use all these equipment and vehicles but never bothered to help themselves if any circumstances demanded. Gitamritam changed all that. 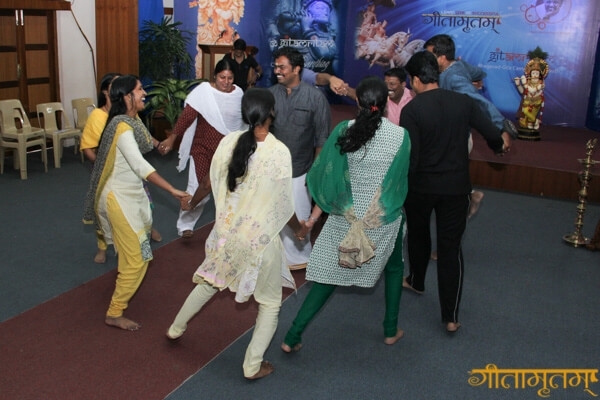 All the attendees had a wonderful time, filled with self-reflection and laughter. 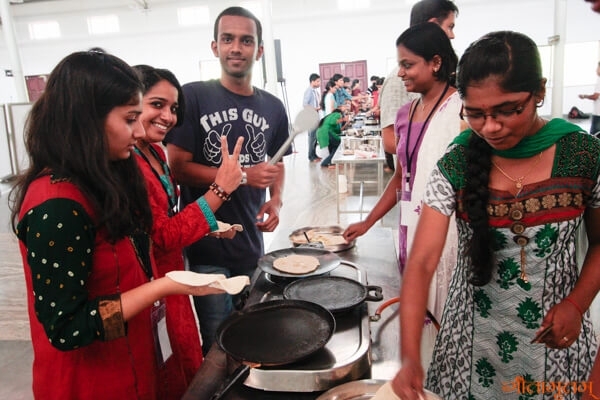 They came away with a better sense of self and an increased level scriptural knowledge, with the goal to apply what they learned at the camp in their lives. 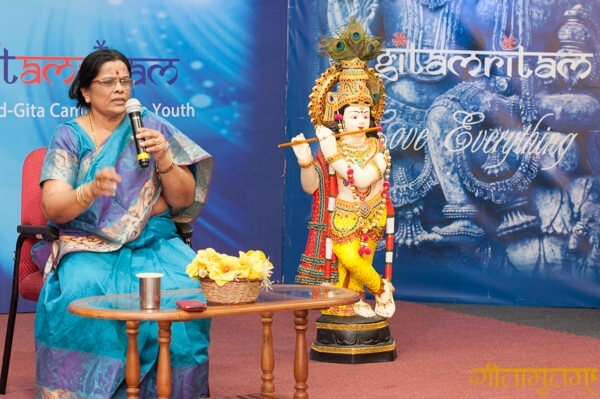 When asked to reflect upon what they learned, Dr.Dhanya Prasad stated that she learned how to apply the Bhagavad Gita practically in her life. Valli Kannu noted that he learned the value of getting up early and how to live life without complaining. Durgalakshmi CV came away with the important message that it is only God, and no one else, who is ultimately there for us. All who attended the camp expressed a strong desire to take what they learned in the camp and apply to their daily lives. 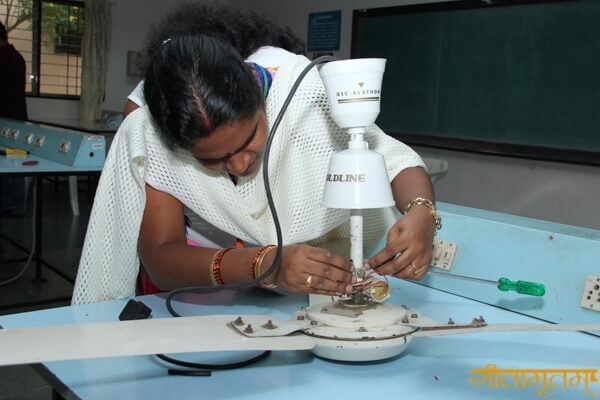 Dr Shanti said she will try to keep her mind focused on the bigger goal. Anila’s goal is to try to practice the few easy tips she got to make her a better human being. 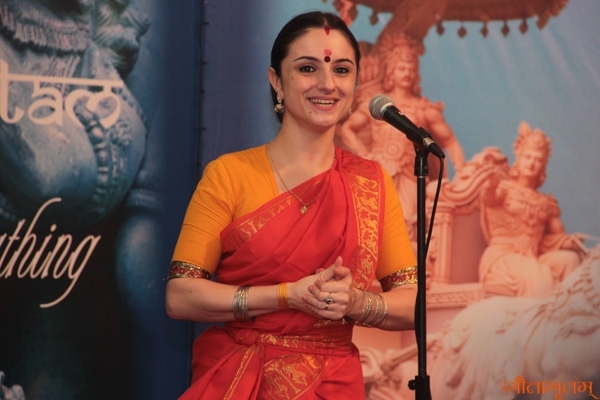 Valli Kannu aspires to accept her husband as he is, look for the divine in him, and worship him. She went on to say that she will try to do all her duties in the name of the Lord, and try to live without complaints. 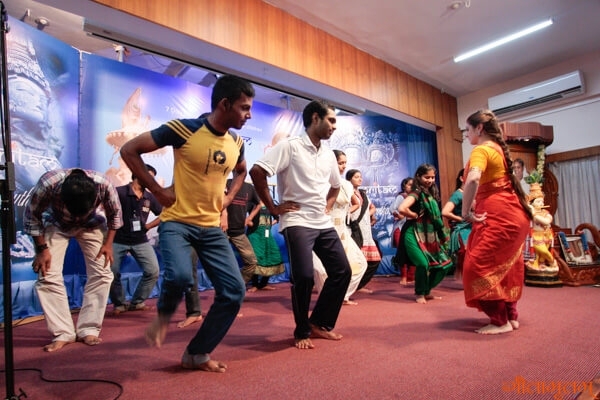 These four-day camp has become a transformative, turning point even in everyone’s life. superb !!!!! 🙂 I enjoyed it like anything. Quite confident enough that I may not do blunders from today onwards…. 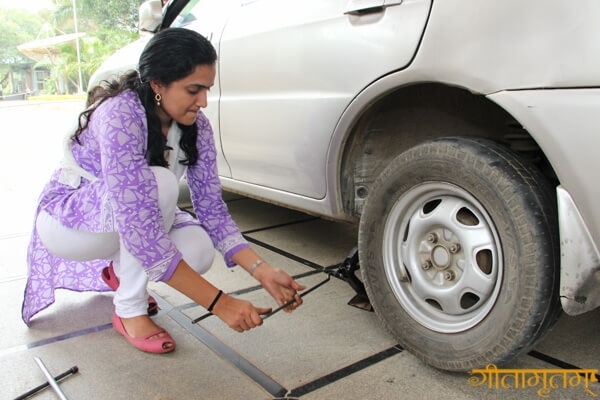 This helped to understand that we can, at any circumstances in future, like changing the punctured tyre. Was able to learn things which I never thought I can do. Good. Very exciting experience and really useful, made us more self-sufficient. A very new and challenging experience. It made me experience that nothing is impossible. Was really really happy to learn something new. We never tried to change the fused bulb or connect a wire or a projector. We always call a mechanic for help, but usually, he will not come in time. Now we learnt that we can do such things without help. We are capable of doing it. Changing the car tyres was the best part. 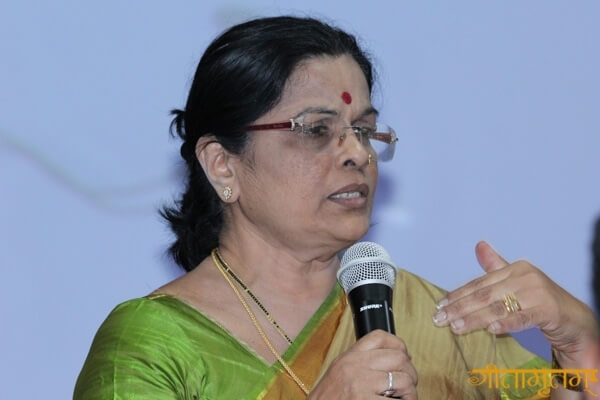 The psychology workshop was taken by Dr. Leela Ramamurthy, Retired Principal, Chinmaya Mission, Chennai, and who has more than two decades of practical experiences in dealing with children, parents, and teachers. She discussed the difficulties faced in the various cases she came across during her practice and the means to overcome them. 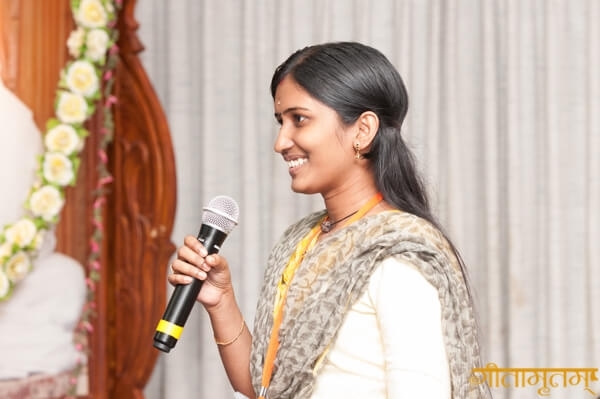 S.Subramanian: Her examples made me think towards my own child and how I can contribute – The Questioner also made me think about how much I know my wife. Valli Kannu: She gave many true examples for parenting. We learnt how to say no to our children and how to be caring. We also learnt how to make them learn and that we should not impose our desires on them. I also learnt what is a home and a house. 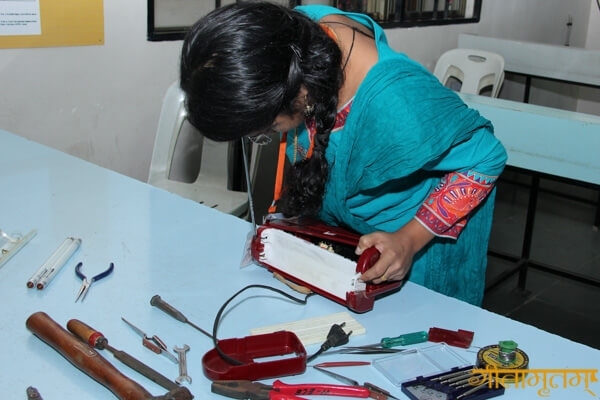 Dr.Manjula Arun: Got answers to many questions from her workshop. 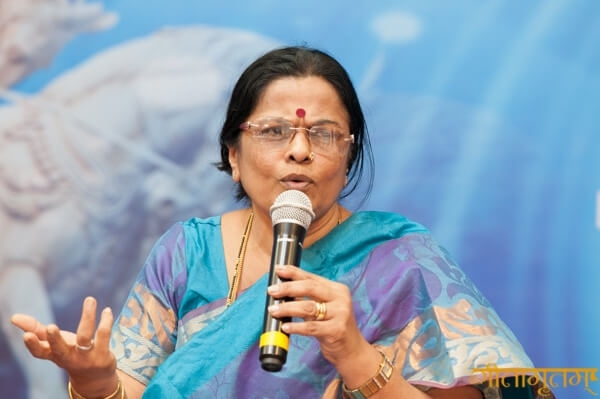 Dr.Dhanya Prasad: Got an idea on how to interact with children and their feelings. Anila: Very useful session. Parenting is a very important factor which she beautifully explained. 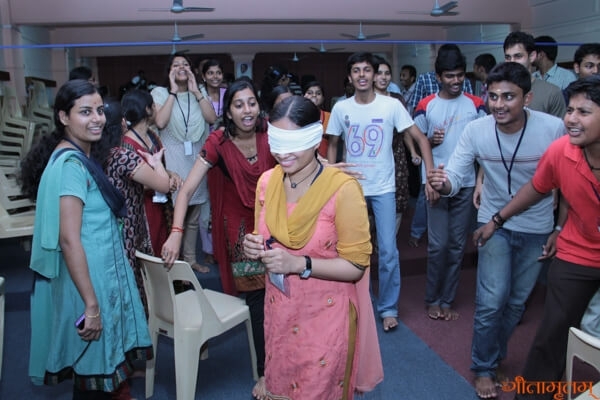 Durgalashmi CV: The parenting class,role-playing, and short movies made me think. The mams class was good. Shanti K: A good and sincere teacher. Her sharing of her experiences with the participants were very helpful. The activities were good. When food is cooked with love then the senses ceases its action only heart responds. Well I had a good time making paratha and tea. It is helpful for preparing our own food at times of emergency. Cooking the thing given to us was like playing a game, waiting to know if have I won in it. 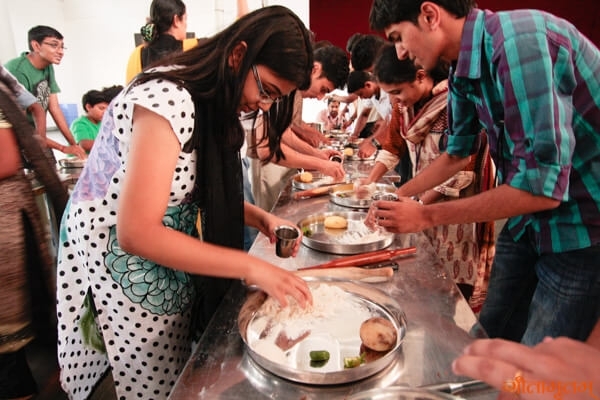 Cooking was another fun and we celebrated it and enjoyed it. My aloo porotta was a bit hard but I think it was tasty (believe in ourselves). This is my first time cooking and I learnt how to prepare food. I learnt how much difficult it will be to cook for my mother. Every time I used to cook for myself but I couldn’t bear to taste it. But I know that it was done by me so I cant blame myself. 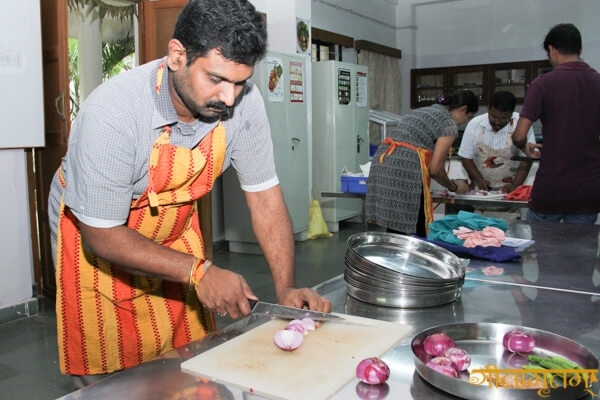 Jayashree mam taught me how to cook like my mother. Thank you mam. Cooking! I was filled with happiness after eating the parathas made by my own hands. This session was superb and I learnt that if one cooks a dish along with love, it’s most most delicious dish in the whole world. Cooking was a very enjoyable event. I have made up my mind to learn cooking properly from my mother in the holidays. While cooking we got a point about how much patience we should have to get our need. In my life up to now I never cooked any thing but first time I did in that class. Then I understood how we need to manage everything, then only taste will be good, and life also. My first experiment with wheat flour, chilly and stove! Incredible. I feel that I should be cooking with this love and care whenever I do! 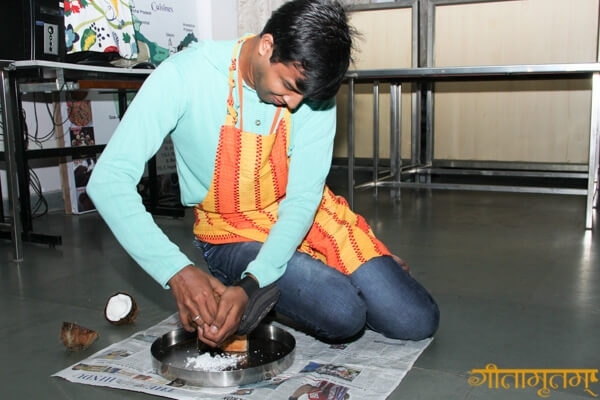 Though I knew cooking I really enjoyed it when I was doing that with my teammates. It was so interesting. I was completely bowled over the new multidimensional approach to cooking. The finding of flavours through smell and taste taught me how unaware I was about all these things. The aloo paratha and tea preparation is etched in my mind. We also learnt some great philosophies of life during the making, garnished with team effort. Thanks for all the fun and sorry for all the stomach troubles because of testing our dishes to you and thanks to Dhyanji. I could have the most delicious aloo partha. Hard work does give tasty fruits. Cooking was wow!!! First time in my whole life that I made aloo ka paratha. That experience of cooking something knowing that it isn’t perfect nor tasty, but the love and hard work which is involved behind it, counts. I didn’t cook well but I will try it at home. 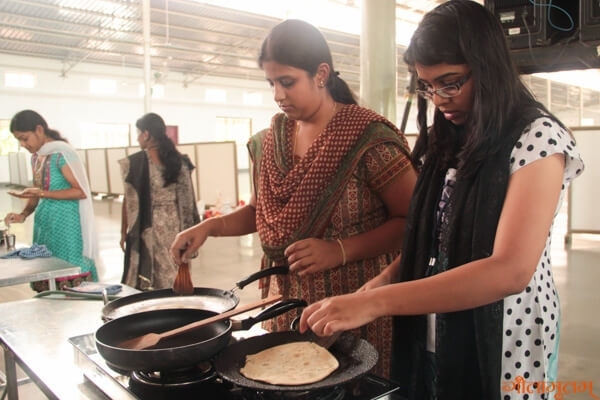 Cooking was interesting for me, because actually I was searching for the recipe of the aloo paratha for cooking. Finally I studied how to make aloo parathe. Wow, a wonderful experience it was. 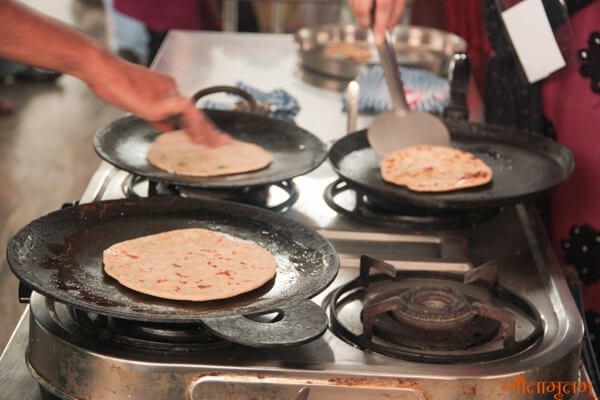 Learned to cook aloo paratha as well as masala tea within the stipulated time and it was fun. Came to know when we cook food with love, it becomes tastier. 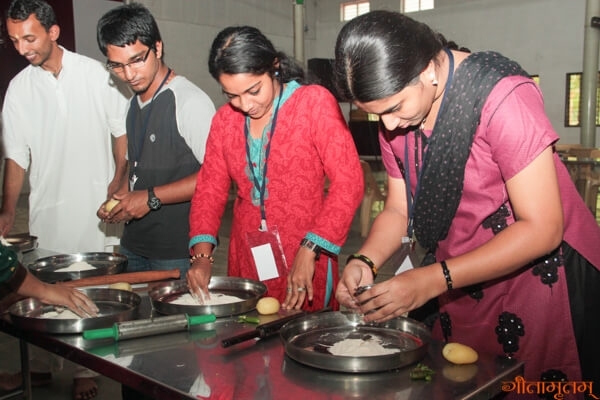 Cooking was really an awesome experience for me. Being a girl I never cook anything by myself but I enjoyed this activity a lot because I was cooking with love, and enjoyed each and every second. From this I learnt when doing any activity with love, the result also will be very sweet!!! I never knew much about cooking. A bit ashamed to say that, still had a fun filled, interesting time over there. Superb. 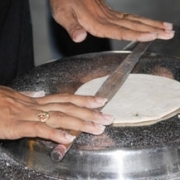 I love cooking but I did not know how to make aloo paratha. I think now I could make it more easily. Didi, lots of thanks to you. Jaysree didi’s cooking class was awesome, useful and in a way very funny. Personally speaking, now I know how to make aloo ka parattha. Thank you Didi. In the cooking session, I got a start to cook. I have not yet developed the interest to cook, but now that the seed of interest is planted in my heart. Hope it grows. The cooking session was great and I enjoyed it very much. I learned that when my mom cooks with love, the food is more tastier than when I make it. Aaah, Didi taught us to make paratha and the best part was with only aloo I prepared parathas and helped my friends also. We had a good team work. Thank u mam. Through this activity I came to know how much my mom suffers to prepare food, from now I won’t demand the food. I will accept what ever she gives, and help keep a smile on my moms face. 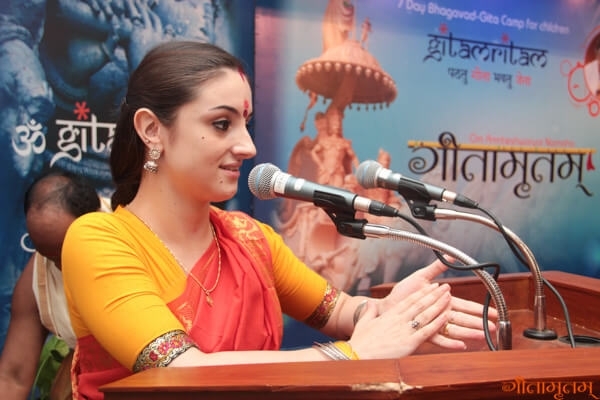 She inspired how to learn Gita from cooking also. We came to know how to cook and it very difficult. I realize our mothers’ difficulty. Thanks, I’d never cooked before. 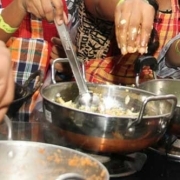 I learnt what’s cooking and also to cook with love. It is not that all food is good but only love makes it more tasty. I never knew cooking. I really got to know how to make aloo paratha and chai. 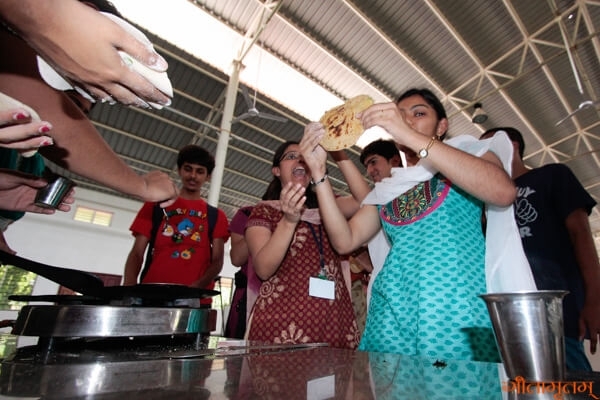 It was my first experience to make aloo paratha and it was a good experience for us and everyone help us to do it. Wow wow! First time I used all my senses together and analyzed every taste and smell. 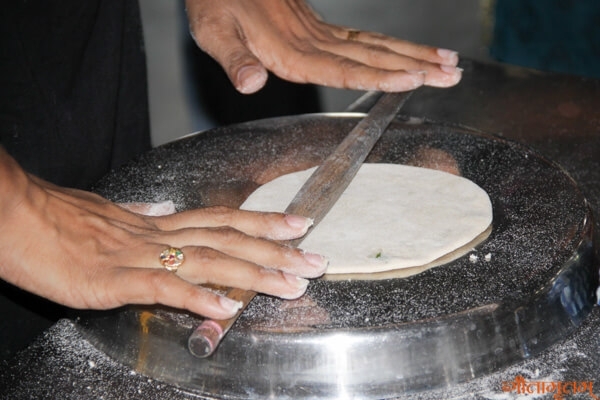 Our paratha and tea were not very good but the happiness we had in creating our paratha was the best. I did not know how a half-cooked aloo paratha tastes. Well, except for the slight bitter taste, our chai was good. Now, I will never complain about food. It was really fun ! First time I learned to cook myself!! And since we were randomly divided into groups, got to know everyone even more. Superb ! This was really an interesting session. We had lots of fun and also learned that cooking requires concentration and it is not an easy task. 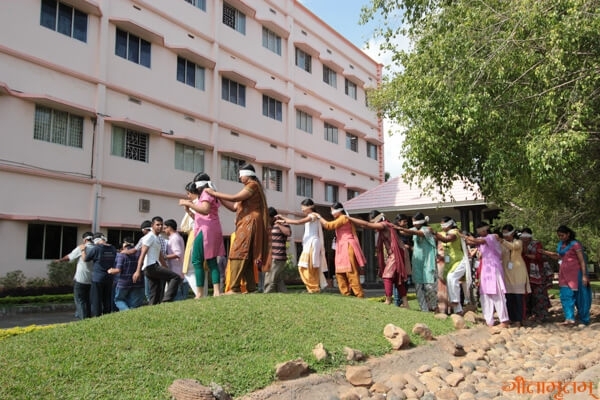 A photography workshop was conducted by Br. Dhyanamrita. He explained how to take an interesting photo and what frame of mind one needs. One of my interests is photography. Till I attended this class I didn’t know that photography can also be related with Gita. Swamiji taught us how to take good photographs of this changing world and life. Thank you, Swamiji. I was a boy with fairly no idea about photography. All I used to do was to take photos without having much knowledge about the technicalities involved. Thanks to this session, as it brought about a big change in the way I look at and imagine objects. I gained knowledge on the creativity behind the photos, like how to take photos in the right ways – eye, view, etc. That was the session which I found was amazing. I could come to know various things in photography. I learnt how to take a photo and I got few good tips. The photography workshop was very informative and inspired us to be creative. With this we saw how beautiful the nature is and how we can enjoy the nature. I like this class most because I learnt how to take photos more effectively. Eyes are not enough to see but important. See everything without any bias and prejudice. Seeing is happiness! I really like to click photos but didn’t know how to do that correctly but here I came to know how to do that properly. It is very easy to think just clicking pictures makes a good photographer, but photography is a way of mind is something I learnt. Things about various nontechnical nuances of photography was taught which I think will be taught nowhere in the world(100% guarantee). 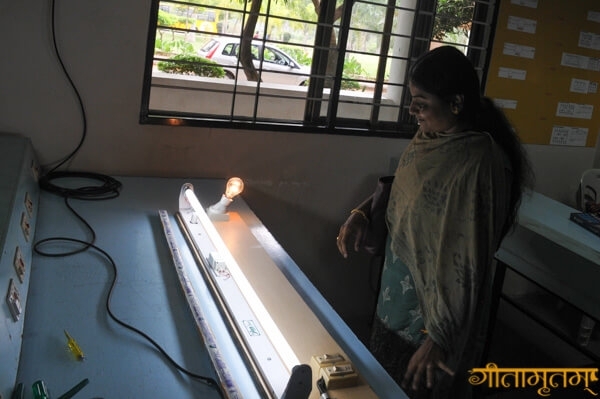 The pictures which we saw were too creative, innovative and kindled us to think differently. The proof of this was us trying our hands-on-photography during the trek. Dhyanji you are very versatile. The session taught us the angle through which a photo needs to be seen and when it should be clicked. Although I expected a hands-on workshop, I learned a few concepts of a ‘good photography’. Wow, that’s epic. From photography, I learned that everything in life should be achieved at the right, time right place and that is how photography is. I love photography, it is my passion. 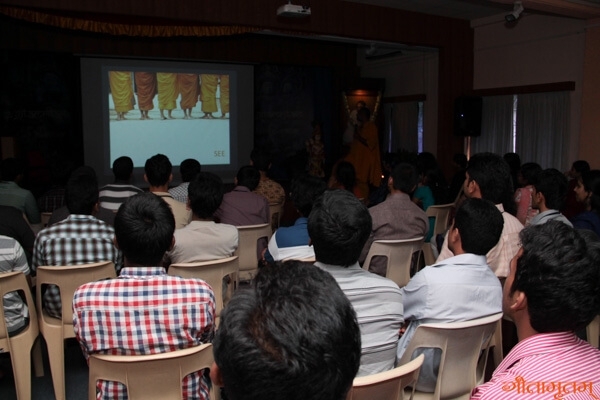 Swamiji helps us to know more about the photography. The session was very interesting and informative. Got more interest in photography. Well, I got to know that photography is not just about clicks and cameras, but the attitude, the passion, and patience is important as well. Loved it!! We came to know about the aspects that make a photo meaningful and powerful through Swamiji’s vision like right mind, right frame, right moment, right eye, right settings, etc. From this section, I learnt how to take the right decisions. Before attending I was very weak in my decision making. Now onwards I will opt for the right thing. I only knew to pose. It was the fist time encountering the technical aspects. It was worth it. It was a nice session by our Swamiji and nice pictures. I got amazed by seeing that we can take a photo in different angles. 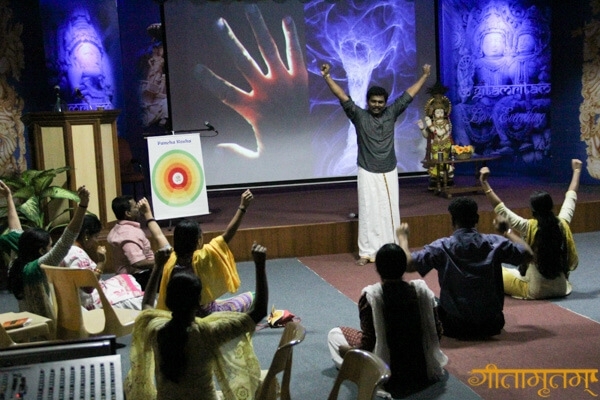 Swamiji’s photography workshop was very useful and informative. He taught us the different ways and dimensions to take a photograph. I would like to thank him for his effort, even though he has not taken any official classes in photography he is a photographer by nature, he shared with us his life experiences. Dhyanji, You opened our third eye, the camera and taught us the main qualities of a photographer which we can’t learn from anywhere else. You also made us realize how to use this third eye to see what our normal eyes fail to notice. Thank You, Swamiji. After I became interested in photography I am more aware of the movements happening around nature. 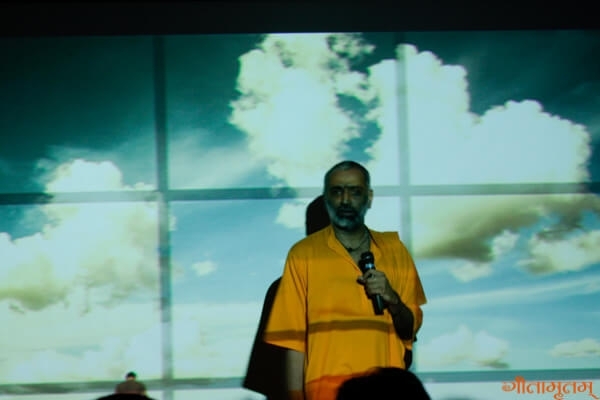 Thanks Swamiji for sharing the knowledge of photography with your students. It gave me some passion to continue as a hobby and ideas in capturing exquisite photos. It was totally a new thing for me. I wished to always be there in the pictures but didn’t want to click pictures. Gita helped me in looking through the cameras eye with new creativity. Photography, as is my hobby (wild life, nature and portrait) is the most interesting thing to me. And I have improved my photography through this session. Since my passion lies in photography I knew most of the things. Also I should mention dhyanji is very good in his photography skills. It was good to be frank. I got interest after seeing all those photos. First time in my life I looked at my world with the hi-tech which the Lord has given to me. I understood how photos too change the world. This session taught me to how we should think and act when we take photos. I got to know what is special about photography – “see through your mind not camera lens”. Started taking photos which I feel is really different. 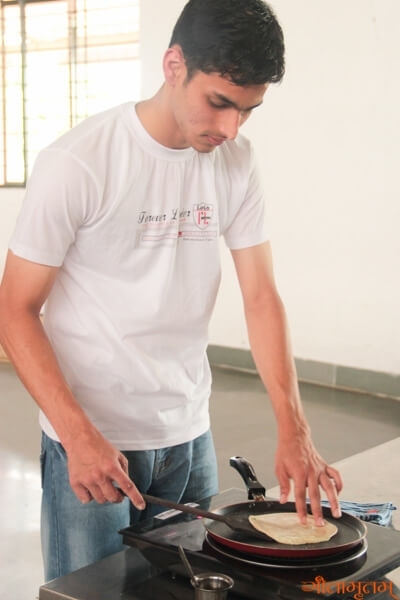 Dhyanji once again helped us with a few tips which are very useful. 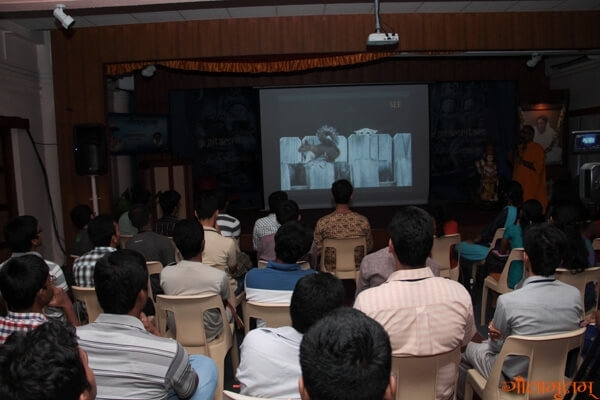 A well-conducted workshop by a self-trained photographer. Our beloved person with the most captivating laugh. Guess who? I thought taking a photo was only to view the picture and just click it but now I understood it needs something more than that. I did not know anything before. I think I acquired some aesthetic sense. It was fun. The class was taken from a totally different and an amazing point of view of the person standing behind the camera. Even in spite of not being interested in that stream it was a wonderful experience to see those fantastic shots! From this class, we learned the importance of concentration and also learning the factors required for a photograph was interesting. The session was good. Got to know the essentials for taking an interesting photo. 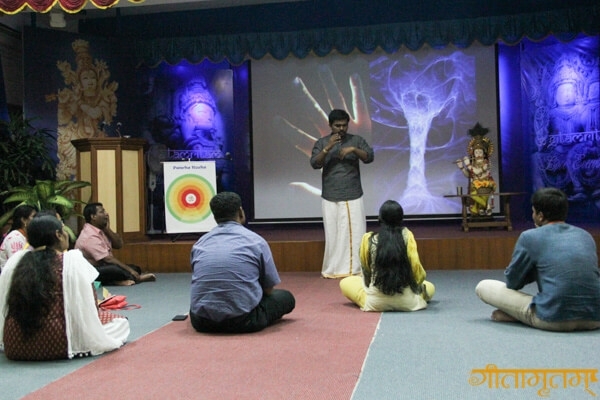 Shankar Kumaran conducted the Shraddha workshop on 2- 4 June 2013. He introduced the Panchakoshas, the five layers of human existence to the campers. 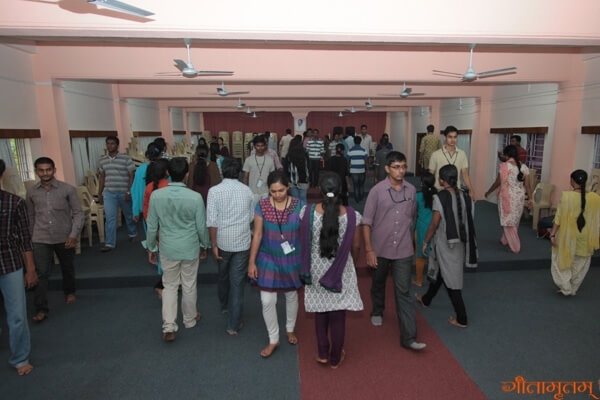 His sessions focused on increasing concentration and awareness through various kind of activities. Breathing exercise to control and change emotions were also introduced. 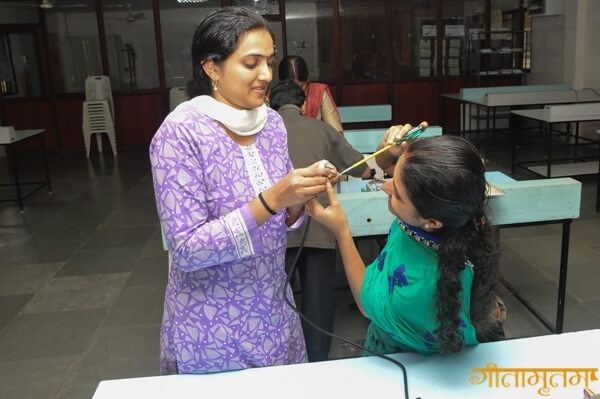 Games and classes helped the Yuva to realize and recollect the innocence they had left behind, in the venture towards so-called ‘maturity’. 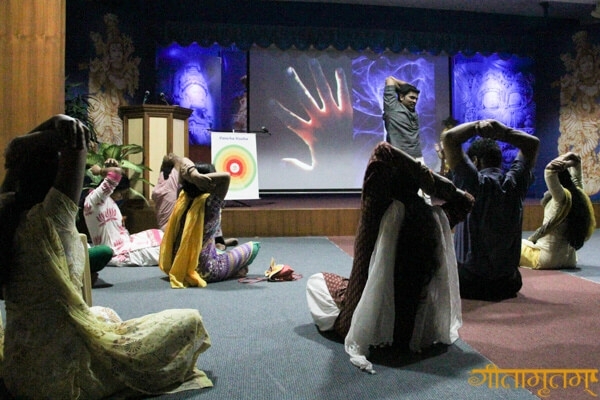 He also gave activities to help the campers learn and enhance the power and sensitivity of all sense organs. 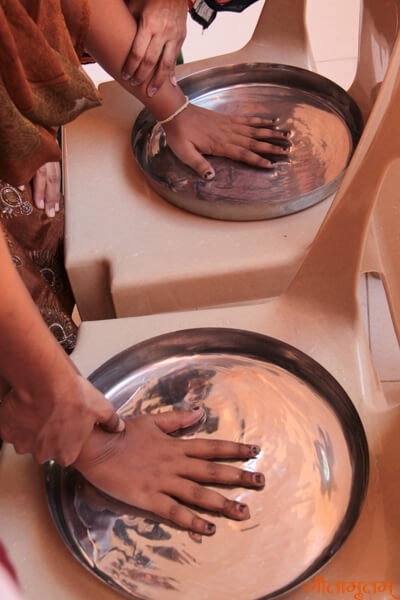 The games were really great and it made me know the real values of the senses and their purpose. It also helped to learn to trust each other and also promoted my interest to help the needy in the ways that are possible in my life. With Sankar sir’s classes, we got to learn how to control our senses, to use them, and how we can get happiness with them. This class is very interesting because nowadays we are losing our concentration. Shankar sir is like Sherlock Holmes or rather Sherlock Holmes is like Shankarji (confusing right??? ):) This session was as though a needle is passed into a banana without the banana itself not knowing. 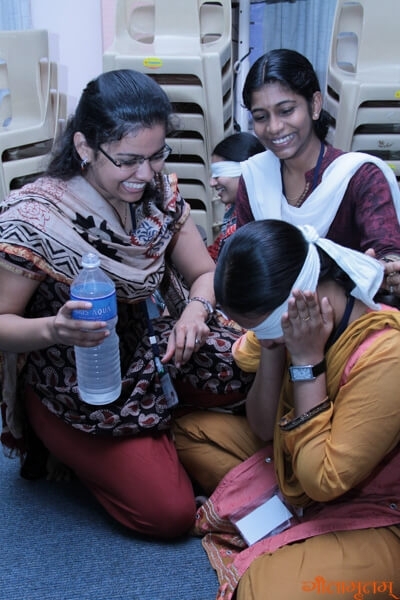 Shraddha was learnt practically through the innovative games we played. 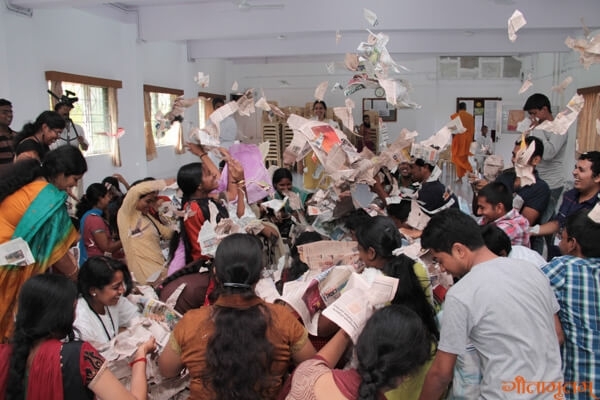 The most awesome and qualitative sessions of the camp, the practical application of Gita’s concepts in life. These sessions really made me realize that we have stopped living, thanks to Shankar Sir for making us realize that. 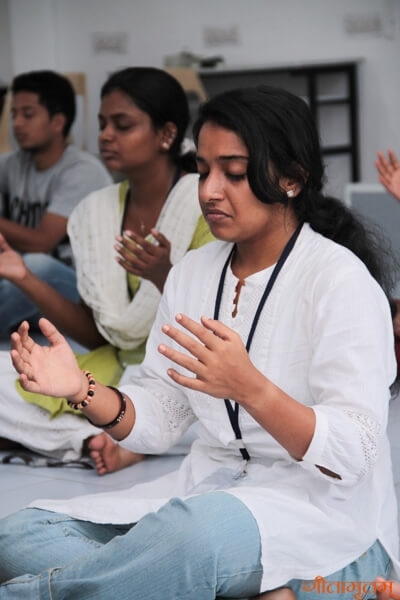 Shraddha classes awakened me to a new world. From all the classes I was learning a lot of lessons. Shankar sir is really great, he makes us understand macro things through some micro activities. It was a totally surprising experience as I met my happy, innocent and loving self. I recognized the capacities of my body, and the levels to which I could really reach. The most active part of the camp, making us forget boundaries of age and enjoy games, which actually enhance our concentration and make us focus and be in the moment. It was really an interesting session and we enjoyed it a lot. Shankarji is an awesome guy. The way he took his sessions was truly amazing and innovative. Thanks to him that I know what ‘Shraddha’ is. Learnt how to mingle with everyone without any fear. Shankarji is one whom I met first in this family. He taught us how to feel and experience ourselves. Now if I know who I am, it is also because of Shankarji. Thank you for giving me this chance. Learnt a lot. The most important thing is, having control on annamaya, manomaya, pranamaya, and vigyanamaya are the goals in our life whereas attaining anandamaya kosha is the ultimate purpose in my life. 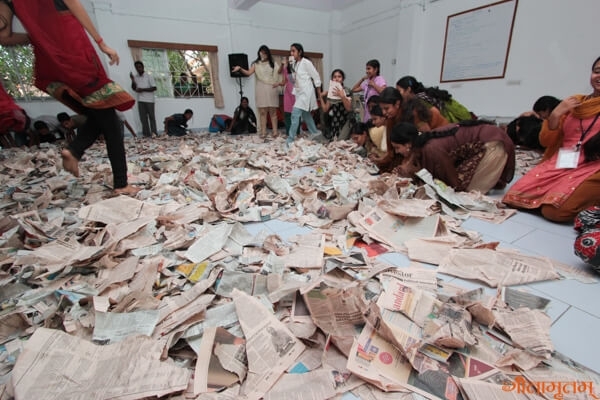 The paper tearing session was the best which bought out the innocence out of me and I am really thankful to Shankar Sir for providing us with this wonderful opportunity. Shraddha never let the spirit of the camp to go down. It maintained a balance between joy and boredom. In that way, it was an essential part of the camp. Wow! Never in the world did I think that life’s most important aspects can be conveyed in this manner. I salute the approach. It was thought-provoking and blissful. It was really amazing and had a very good time. I got lots of information which I have not known these many days. It was practically explained what Shraddha is through all the amazing games. Thank you so much, Sir, for bringing back the innocence in me one more time. He is such an amazing guy and super cool. Shraddha session was awesome, I can’t express it in words. The most interesting session.. He made us go back to being little children. We were doing what we felt like doing. We were not thinking about what others will think about us. Each and every moment we were enjoying, and I think we all are happy now. He made me ask “why in the world should I be serious all the time? “. It’s one life and definitely, I am happy that I got to meet such fantastic people here. Though Shankarji had designed those sessions with fun and entertainment, the original purpose for developing Shraddha and lifting ourselves from Annamayakosha to Anandamayakosha, which was well understood.! 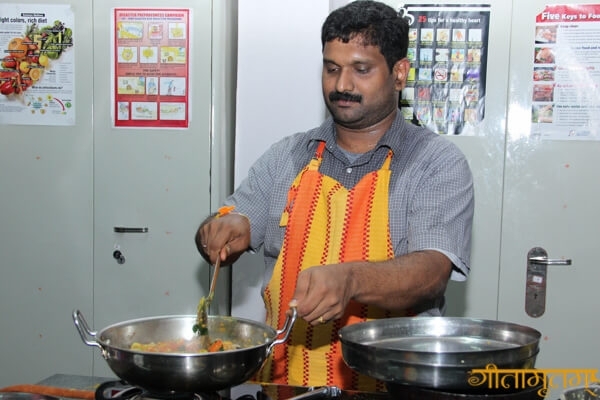 Shankar chettan, awesome human being who is innocent at heart and taught us the value of being innocent. He made us realize the meaning of life and showed us where we can correct ourselves. He gave me a wider perspective of my skills and the fortune of having a perfect body and life. I started to respect people with disabilities for their courage and patience. Thank u so much, Chetta. 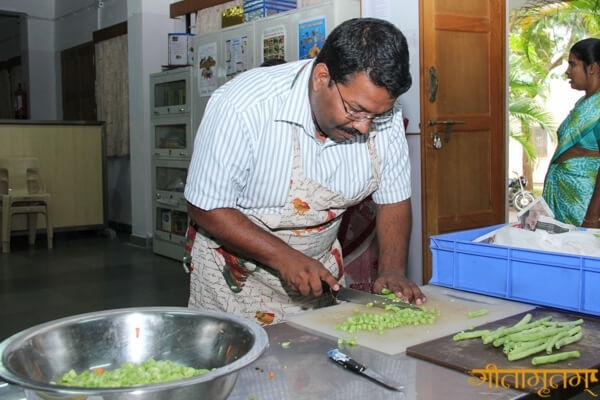 In Shankar chettan’s class, I realized how serious I had become as I grew. His class brought back my innocence and enthusiasm. He also thought about the koshas and that the only necessity needed for our survival is happiness. The moment I saw Shankarji, I didn’t think he was capable of making every moment so joyous and lively. I was wrong. He reminds me of Br. Manoj’s activities, jokes, and compliments that he did in camps. The session was awesome and hope to attend more in the future. In the first, this was the most confusing class but I understood the values which was taught by Shankar ji. I am inspired by him, and the way he teaches is awesome. 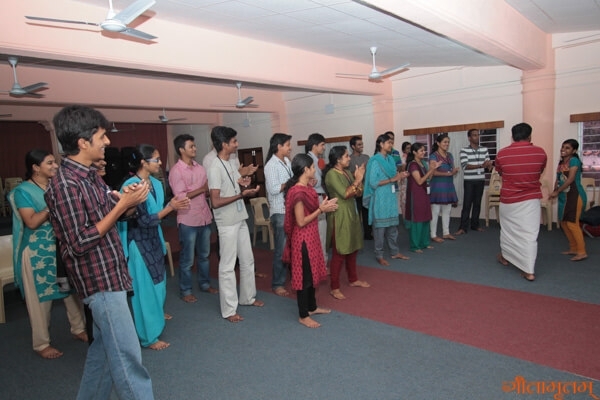 Shraddha classes made us realize about our self, the common misconception on who we are. 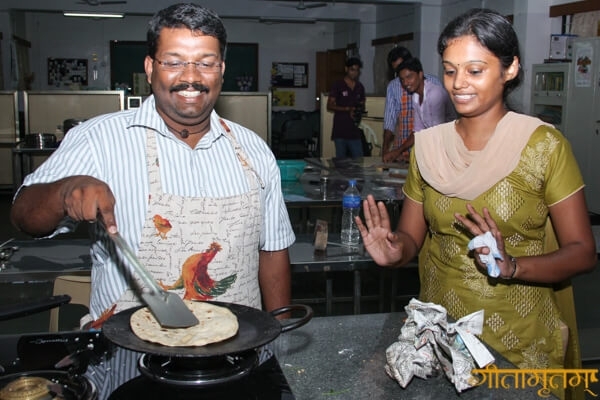 Shankar sir teaches the concepts with the help of various activities, which we all enjoy. I am doing my MCA and I was worried about the fact that IT people have higher stress levels than any other professionals according to statistics. I was searching for the reason and I got the answer through one of his class, which helps me a lot. Thank you Sir. Shraddha class helped me to know what is faith and the full meaning of Shraddha i.e. explore, inquiry, awareness, etc. Made me find who I am. Shankarji is the coolest person I’ve ever met. I enjoyed his classes to the core. 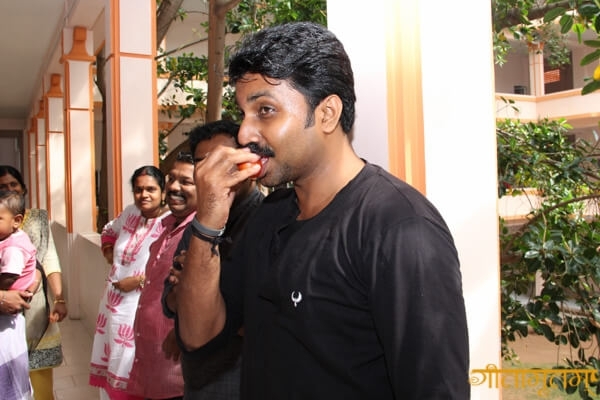 Shankar sir was a great person who was very friendly with all and taught us more things and give us more inspiration as he taught and more lessons. We all loved it and we miss him a lot. Shankarji- a person filled with life and enthusiasm that is unmatched by any other teacher that I have come across so far. We rediscovered our childhood innocence that we had lost. 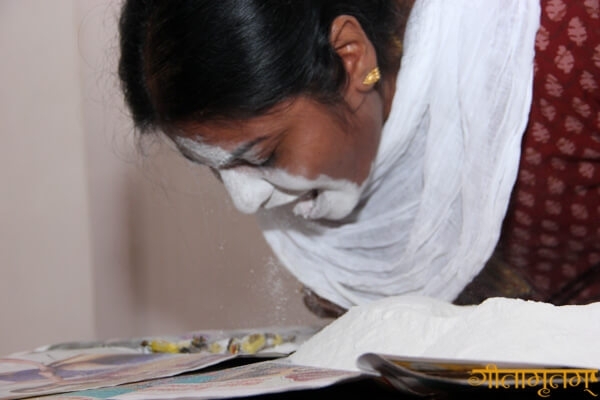 The most memorable part of it was the “paper abhishekam”. Ji, you taught us to look into ourselves more than anything else. I just enjoyed it to the core. Learnt a lot. The most important thing being, having control on annamaya, manomaya, pranamaya, and vigyanamaya are the goals in our life whereas attaining anandamaya kosha is the ultimate purpose in my life. 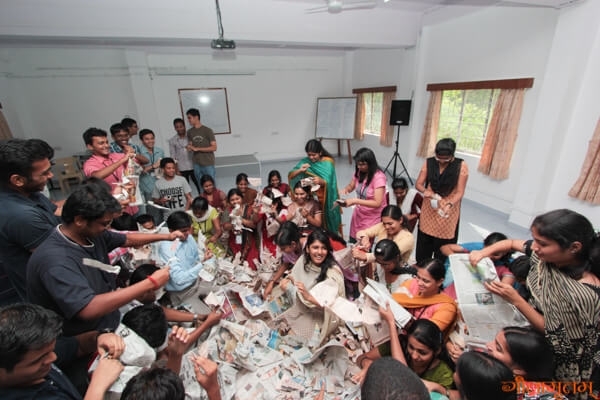 The paper tearing session was the best which bought out the innocence out of me and I am really thankful to Shankar Sir for providing us with this wonderful opportunity. Shraddha never let the spirit of the camp to go down. It maintained a balance between joy and boredom. In that way it was an essential part of the camp. Wow! Never in the world did I think that life’s most important aspects can be conveyed in this manner. I salute the approach. It was thought provoking and blissful. It was really amazing and had very good time. I got lots of information which I have not known these many days. It was practically explained what Shraddha is through all the amazing games. Thank you so much Sir for bringing back the innocence in me one more time. The most interesting session.. He made us to go back to being little children. We were doing what we felt like doing. We were not thinking about what others will think about us. Each and every moment we were enjoying, and I think we all are happy now. He made me ask “why in the world should I be serious all time? “. It’s one life and definitely, I am happy that I got to meet such fantastic people here. 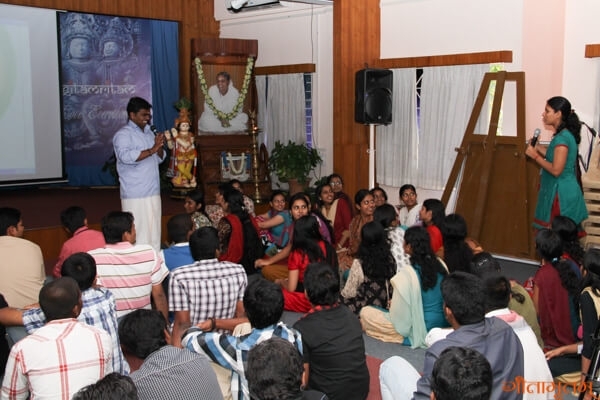 In Shankar chettan’s class I realized how serious I had become as I grew. His class brought back my innocence and enthusiasm. He also thought about the koshas and that the only necessity needed for our survival is happiness. 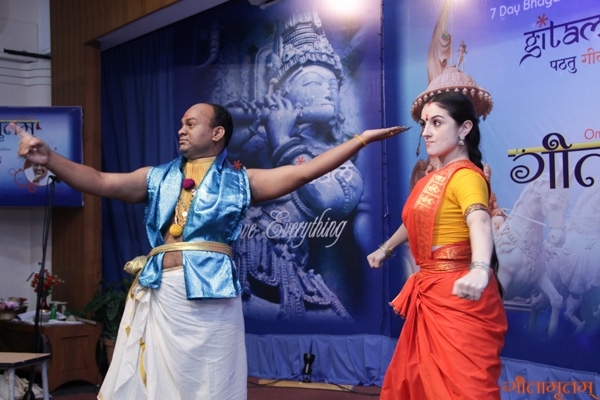 Paris Laxmi and Pallipuram Sunil performed and demonstrated both Bharatanatyam and Kathakali. They performed and shared the Navarasas and various mudras of Kathakali and gave practical sessions of basic steps of Bhartanatyam. 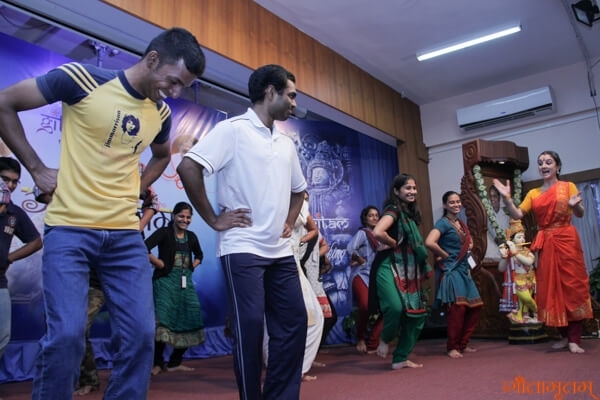 During their session they spoke about Rhythm which is a basic component of dance. They spoke about how practice makes perfection, and the learning an art form requires passion, dedication and hard work. 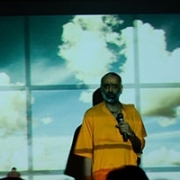 At the end they presented ‘Gitopadesham’. The very important aspect of the life is to enjoy your passion and practice to be happy. Their performance proved that any difficult thing can be made easy if it’s done with dedication and love. Wow, dance!!! No words to express. After years I am dancing Bharatanatyam in the stage. I was very happy. But the great wonder was that she is only years elder than me! It was a good experience to see her dance. She took my fear away and she gave me the love and passion to dance on the stage. She also took me to heaven with my Gitamritam family. Thank you ji. Whatever you do, do it with sincerity and you have a purpose in your life. I was thankful to be dressed up as a Katakali artist. It was amazing. 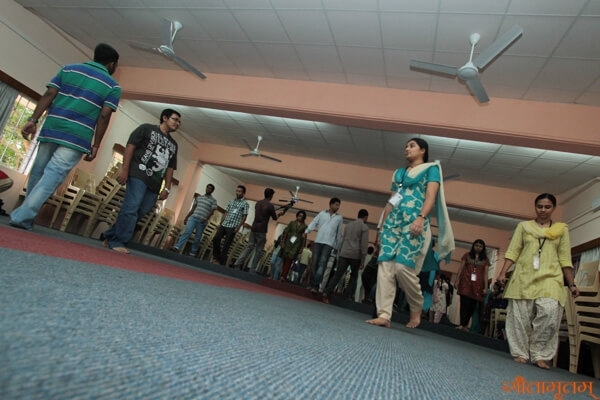 This workshop made me realize that verbal communication is not the only form of communication. Dance is a more creative and innovative style of communication. With this we got to know how we to enjoy the arts and intricacies of them. I like dance but I don’t know how dancers make it so beautiful. But after seeing her dance, I came to know that we can make anything beautiful by doing it with love. Kathakali was really amazing because by seeing him I came to know we can express anything without talking. I remembered that “action speaks louder than words”. The dancer and the dance is not different, we were mesmerized with both of their dedication and how they complemented each other. 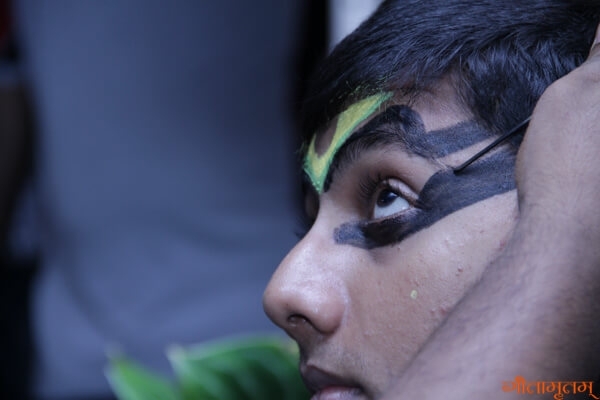 The Vasudev makeup session was the highlight. I was amazed to hear a foreign lady know so much about our dance form and adopt our custom. I totally agree that our traditional attires go well on anyone in the world. 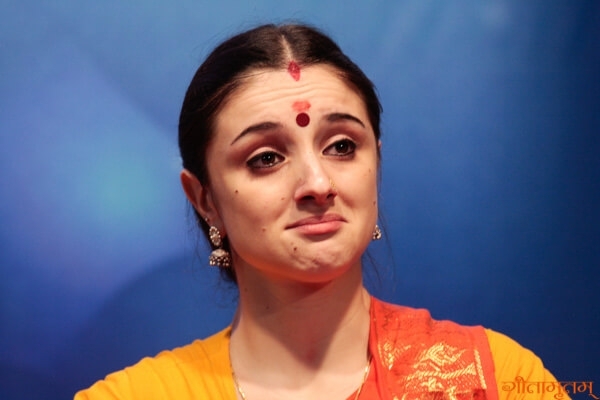 Her expressions, beauty and dedication to the dance was really noteworthy. The thing which I learned from her was ‘to do everything with a smile and enjoy every moment, live that role to perfection’. It was amazing. Seriously I cried after seeing her performance. She was amazing. She just became the roles she played!! It felt so real and inspiring. Her husband was also great, the basic exercises were real fun. Wow. Never seen such lively expressions on a dancer. They were living their respective roles. Saw the various mudras of Kathakali as well as Bharathanatyam. Practice makes a man perfect. So I decided to put away my laziness of not practicing dance. Also we should be passionate, then only we can have perfection, and that leads to happiness. Blending of two art-forms. Indeed it was a mind blowing session. Superb, loved it a lot. This session was truly mesmerizing. We were all taken away by the dancers.. The expressions of the Kathakali artist was amazing. And Paris Lakshmi swept us away with her gorgeous dance performance! Ma’am, I am not a dancer, but I enjoy it. You gave me courage to try this art form and gave me the perspective of the fusion as a communication between both styles. You showed us the importance of passion and devotion to our goals. It was great. The message she conveyed inspired me a lot. In this class, mainly I liked the art of expression and I want to exercise the facial expressions that the sir taught in the class. The dance program was amazing especially the Kathakali facial expressions and when Lakshmiji taught me some steps of Bharatanatayam. I learned that you don’t need a language to communicate. You just need love to communicate. It is an awesome thing to dance with Lakshmi, such an awesome dancer. Actually I am very bad at dancing, but I enjoyed it. It is all that matters. And I am happy that I could dance. It was overwhelming to see a girl of almost our age achieving so much in the field of dance. The fusion of Bharatanatym and Kathakali was a very good idea. Wonderful pair, I saw good understanding in them. I will try to adopt it in my life to keep my family environment clean and healthy. Complete dedications to their art. I came to know how we have to learn Kathakali deeply with minute expressions and how we have to place the leg. Really when they walked in I realized beauty is not permanent. It’s only “love” that is permanent. The concentration in their work and that they were enjoying what they were doing taught me, and I’ll try to enjoy my work. I learnt what is passion and how to achieve it. I love to dance but I don’t like Kathakali, Bharathanatyam etc. But when she showed some steps I was very interested in that. Now I love dances like Kathakali and Bharathanatyam. A couple who complemented each other in a very unique way, in their own individual sense. Words fall short to describe the way the two popular dance forms of South India blended – Kathakali and Bharatanatyam. I learnt what is passion from her and to be happy in whatever we do. It was beautiful. The expressions, the feel of enjoyment, was amazing. Above all I was taken aback by their humble and friendly mind. Amazing to see an outsider take up an Indian dance style as her passion. Since we had lot of participants, both boys and girls on stage it was loads of fun see all of them learn to dance! Totally an amazing session. We were mesmerized by their performance. Learned that to reach your goal, we require pure dedication and faith in ourselves. Was an awesome dance. 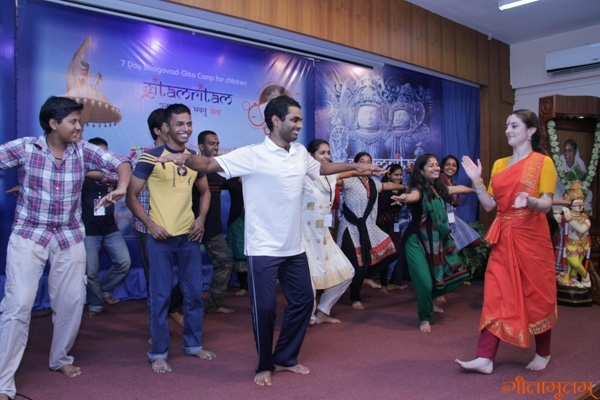 It gave an insight into the classical dance forms of India. Really appreciate Lakshmi ma’am’s passion for dance and that too a classical dance. Great couple and really enjoyed their session. They taught me that no matter what, follow your passion and through hard work and dedication achieve your goal.